Andy moves underneath the steepness above while Lucasz dangles with his camera. 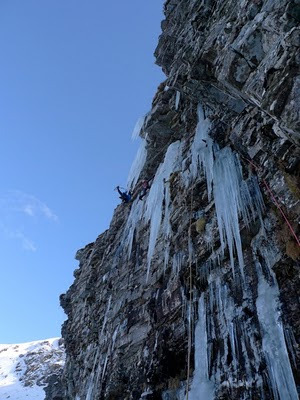 Feeling completely whacked after Anubis day, I stumbled into Ben Udlaidh behind Andy Turner to follow him up roofs and hanging icicles on the lower tier of Ben Udlaidh. The line he’s spotted was a lot better than I remembered the lower tier with lots of steep ice and interesting overhanging corners and roofs. 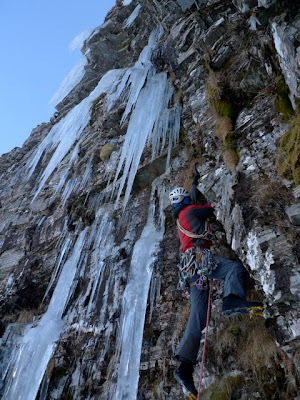 I awoke from my duvet jacket cave to hear Andy battering a hole in the final icicle to pull through. The ropes ran out and I followed in a state of semi slumber, letting out small moans every time I had to lift my arms above my head. Thankfully there was time for about five cups of tea in the Bridge of Orchy before I met Claire for our trip to Glasgow. 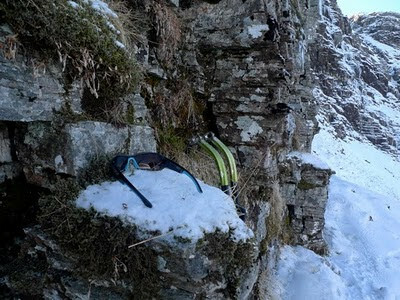 Sums up winter climbing in Scotland over the past month “hold my sunnies, I’m off up this unclimbed icicle”.